If you are a racer you can relate to that, can’t you? There is a certain tenacity and passion that accompanies a ‘racing driver’. 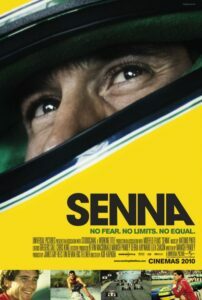 A few years ago at South Boston Speedway a friend of mine, Mike, introduced me to the life and story of Ayrton Senna. I was just 13 years old when Ayrton’s started his last race, and I was not a follower of F1 racing, so I was completely blind to his story. Following our race at SoBo I sat in a restaurant parking lot waiting for some friends for dinner and watched Senna on Netflix. I watched it three more times that week. Amidst one of the larger political struggles that Ayrton faced in F1, team principal Ron Dennis told Senna, “If you are true to your values, if you believe that your values are correct, then walking from the dark forces that you are faced with in life just doesn’t become an option.” Despite the risk, challenges and political forces he faced, Ayrton raced to win. He fixed his eyes on the prize, and he pushed forward. We are all racing towards a finish, to an end. What we are racing towards determines how we are going to race. If our end is status or fame, we will trample others as we work to puff ourselves up. If our end is a high position or promotion, we will sacrifice family and relationships for our work. If our end is material and financial wealth, we will compromise our ethics and integrity to amass what we want. You don’t show up at the racetrack to lose. In the same way, none of us should look at the breath of life as anything less than an opportunity to race to win in life. In other words…race to win!